As you may all know, on the 18th of November was Lily's Birthday and so on the 19th it was only right that we threw her a big birthday party! Last year we had a small party at home and so this year I decided I wanted to go all out and hire somewhere to have a bigger party. So I hired the local cricket club and then and got my friend who is a DJ to organise some fun kids disco music which was very kids holiday camp/Cbeebies and disney. I then also hired a ball pool, and building blocks. I also borrowed a slide from my friend. I invited around 30 adults and 20 children, though not all could make it. I decided to have a theme to the Birthday party. Really I wanted to have a BING party but I couldn't find enough Bing themed things to fill out and decorate a big hall with, so I changed the theme to Lily's other favourite character. Peppa Pig. I decorated the hall with Peppa balloons and banners and was lucky that I could have one thing that was Bing themed and that was the cake. Which was made by my lovely mother in law. Lily was super impressed with the cake and got very excited to see Bing on it. To keep in with the theme of Peppa Pig I got in contact with Party Bags and Supplies who were happy to send me their Peppa Pig Party Pack. 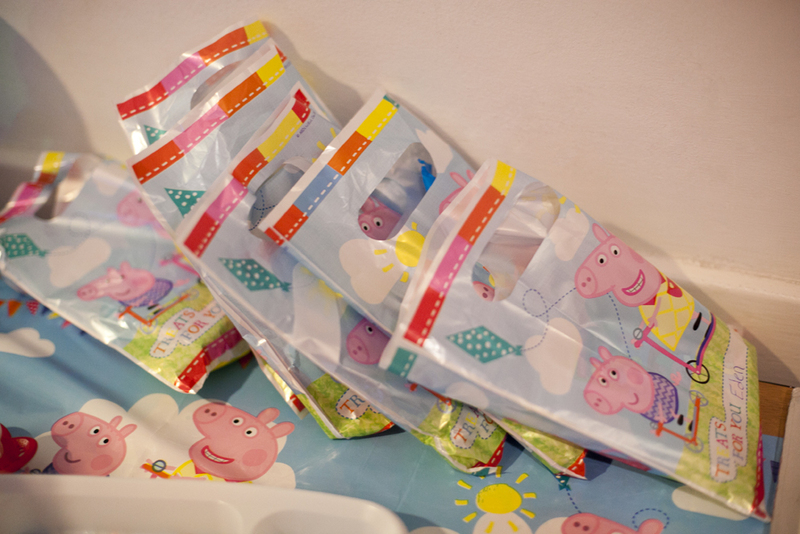 In the pack there was a tablecloth, 8 cups and 8 plates, napkins and party bags. The Peppa design was really fun and colourful and had plenty of pictures of Peppa on. 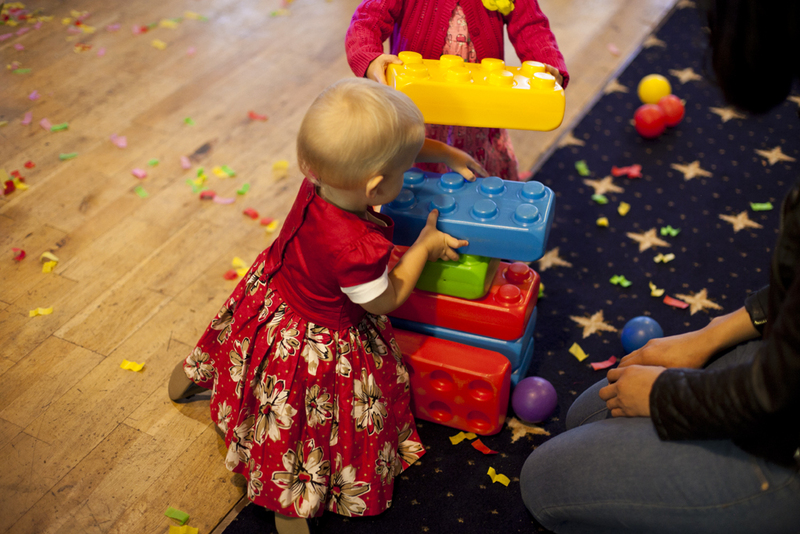 It fitted perfectly with the party and was also great for the other children their as they also love Peppa Pig. The tablecloth was nice and large and also plastic so if anything was spilt on it, it could be wiped up. They table laid out the Peppa items really looked great and It was used to the are where the children's fod was and I think it really made that area stand out. The plates were of a really good size to fit plenty of food on and the cups held just the right amount of juice for a kids party. 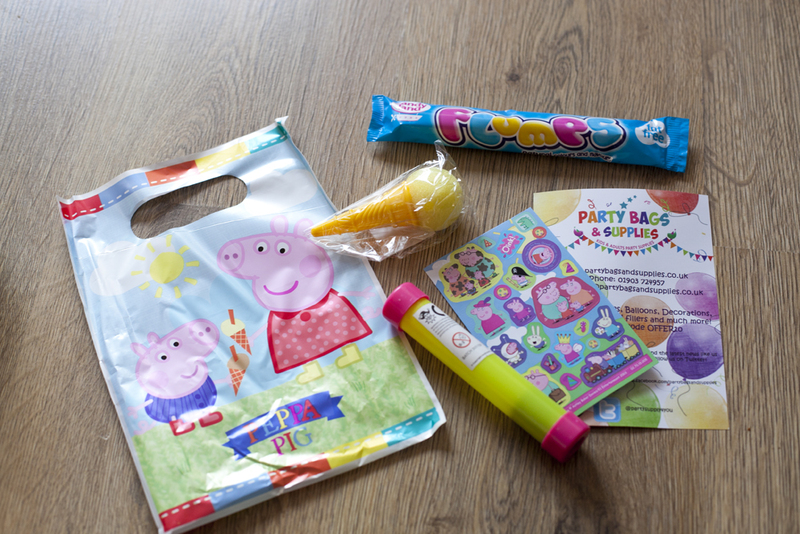 The party bags were filled with loads of fun items, and also stickers which are Lily's favourite things. I was pleased with what was inside of them and I think the children who received them will be happy to. I know for sure that Lily has been playing with hers this week and loving the items inside. The only thing i felt like was missing from the party bags was bubbles! Can't have party bags without bubbled and I think I would of preferred these to one of the items in the bag. 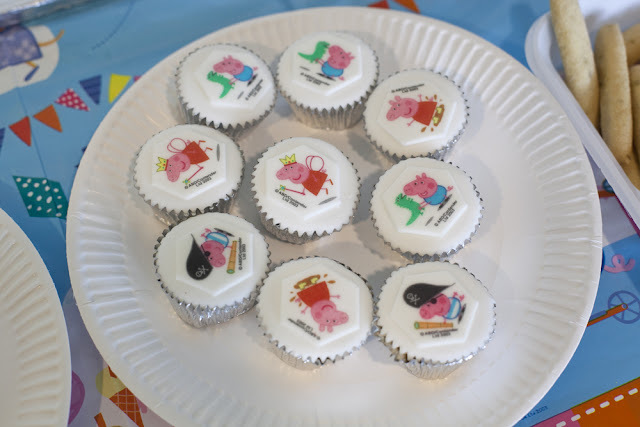 Also to keep with the theme of Peppa Pig I got in contact with Cake Toppers. I knew that they had a great selection of lovely little cakes and you have to have cakes at a party! Upon browsing their website I found that they sold Peppa Cupcakes and I felt these were perfect for the party. They sent me 15 mini Peppa Cupcakes with lots of different Peppa and George pictures on. I know for sure that these went down so well at the party as I blinked and they disappeared. All the children grabbed them and wanted them straight away and my nephew was really excited to be able to have a george cupcake. I was lucky enough to make sure I got one for me and Lily to eat. The size of them are perfect for a 2 year old. Just enough cake and perfect for their tiny hands. The one I tried was delicious, perfectly baked and full of sweet flavour. It was a lovely classic sponge with thick yummy white icing. They were a perfect little addition to the party. I think I would recommend buying double the amount to how many children are coming as I think the children could of quite happily eaten 2 of these and in fact I think some children didn't get one as some may have gone back for another one. Another thing that the children really enjoyed at the party was the juices that were supplied by Appy Kids Co. They sent me 9 drinks that were all fruity flavours. Some of the flavours include Apple with Summer Berries, Orange , Tropical, Orange and Carrot, Forest fruits and Golden Apple. Again these just shot from the table. I blinked and all the children were grabbing them and wanting one. 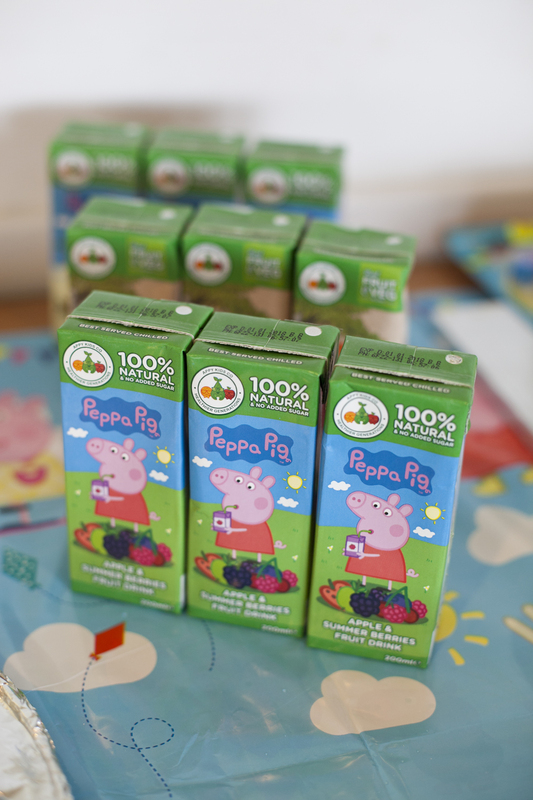 The fun characters design on the juice carton really appealed to them and it was great to have some Peppa ones there to keep with the theme. Lily really seemed to enjoy her juice and I got to try some of hers and there was lots of flavour and they were really tasty and so refreshing. The great thing about these juices are that they are 100% natural, have no artificial colours or preservatives, they are low calorie and low sugar. It was great to know that I was providing the children with juice at the party that wasn't bad for them and not full of sugar. I definetly would choose these again for a children's party. One thing at parties that children do end up eating is lots of sugary foods and so I had in mind some really healthy snacks that I thought would be great for a birthday party. I got in touch with Heavenly Tasty Organics who we taste test for and asked if they would like to provide some snacks for the party. I think with all the sugary non healthy food that is at the party its great to have something on the table that children will love but that will also be healthy for them to eat. 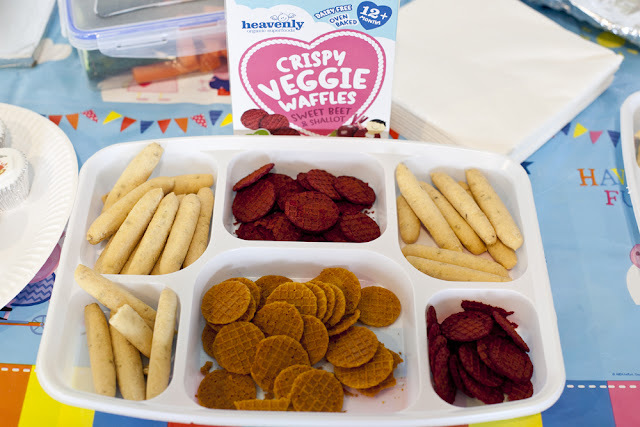 Heavenly sent me some packs of Beetroot and Carrot waffles and some breadsticks for the party.They are all sugar free and have no artificial colours of flavours. They looked great on the table. Especially the waffles as they are so great in colour. That really attracts children to want to eat them. I noticed lots of children with these on their plates and so they definetly got chosen to eat. I heard back from some parents that the children were really enjoying chomping on the breadsticks to. I really think they make a great addition to any party and make a perfect replacement to things like crisps and salty crackers. Lily really enjoyed all the things I had planned for the party. She really enjoyed dancing to the music and mostly enjoyed building with the building bricks I hired. All the other children spent most their time jumping into the ball pool. But I felt that the party could have one more fun activity that the children would love. I got in touch with Eat Sleep Doodle who I noticed have a really fun doodle table cloth! Lily is a huge fan of drawing, and so I knew she would enjoy this. I decided to dedicate a table just to the tablecloth as I know that toddlers can't concentrate on 2 things at once. So I placed out the felt tips and put the table into the corner. The table cloth is a really good size and covered the entire table. As you can see in the background of the pic above. It took a while for children to understand they could draw on it but as soon as they did the table was full of doodles and squiggles. At one point there was 3 or 4 children around the table and all having a good draw and as it comes with 10 pens they all could have a choice of colours. Lily also spent ages on it doing some drawing. The great thing about the doodle cloth is that the children can cover it with marks and colour it and then you can wash it and use it again and again. 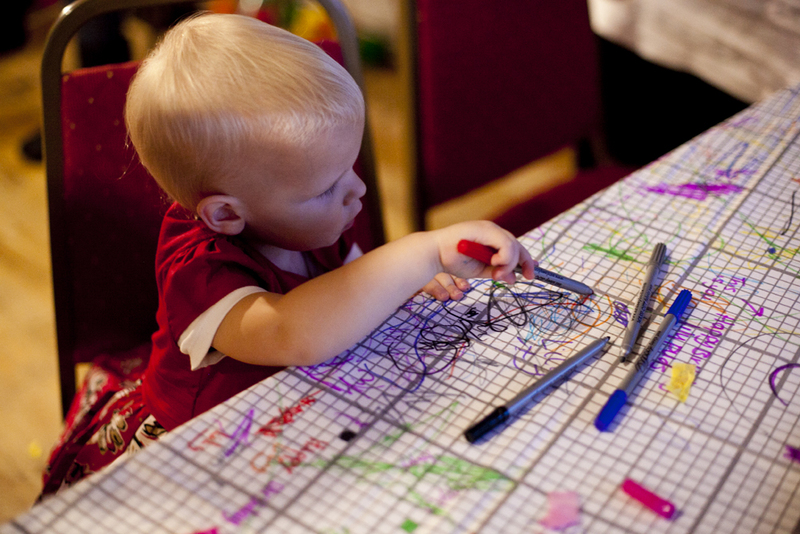 It was definetly a fun activity for children at a party and also great that I can get it out on our table at home for Lily to doodle on. We also found some nice Birthday messages on it that I have taken photographs of before washing it to re use it. Lily and all the other children had a brilliant time at the party. I really think that all the brilliant brands I have just mentioned really did help bring this party together providing so many different elements of excitement and fun. Im so glad I threw Lily a big party this year and there will definetly be more of them in the future. 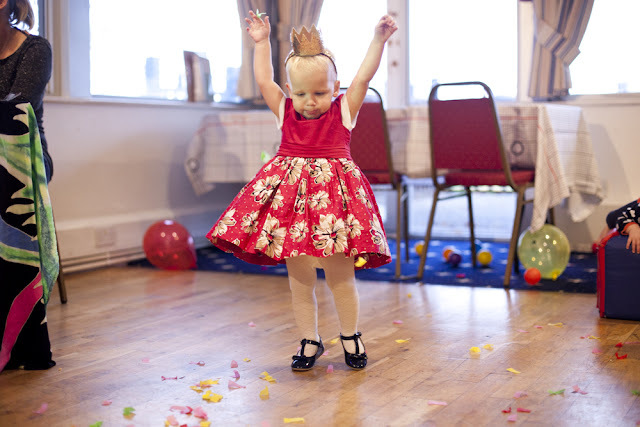 What do you think to the companies that helped create the perfect party for Lily? Would you have a themed party? Have you ever considered using any of the above companies and if not would you for the future? Head back tomorrow to enter a great giveaway where you could win a brilliant party bundle which includes some of these fab companies. What a fab party! Love the tablecloth - extra party fun - and those Heavenly snacks sound .... heavenly! Great way to balance out the sweet cakes. Glad the birthday girl had a great time. Looks like a very fun party. Great planning! Very organised! Sounds perfect for a two year old, has given me some ideas for our daughters birthday in December! Love a good party, looked great :) Having the little bits makes a big difference. Cake is gorgeous, my niece would love this as she is Peppa obsessed also! A wonderful looking party and great themes. My party sizes have grown since I had my children, we always ha parties at home whereas my Grandchildren tend to also go to a venue, much more practical and less stressful than having it at home. It looks like a lovely party, and that Bing cake is adorable! Looks like lots of fun! Love the idea of the tablecloth! Is it reusable? I love how everything is coordinated in the party packs and it means less to worry about. happy Birthday Lily. What a lucky girl you are! The party looks great and so do all the lovely party supplies. Who doesn't love party time? Not me! My daughter is obsessed with Peppa Pig so this is her idea of heaven! What a fab party you organised and although I haven't used any of the companies mentioned,I would definitely consider caketoppers. Some really good links to bookmark for the future. I'd definately consider a themed party - it helps pull everything together and children just love it. 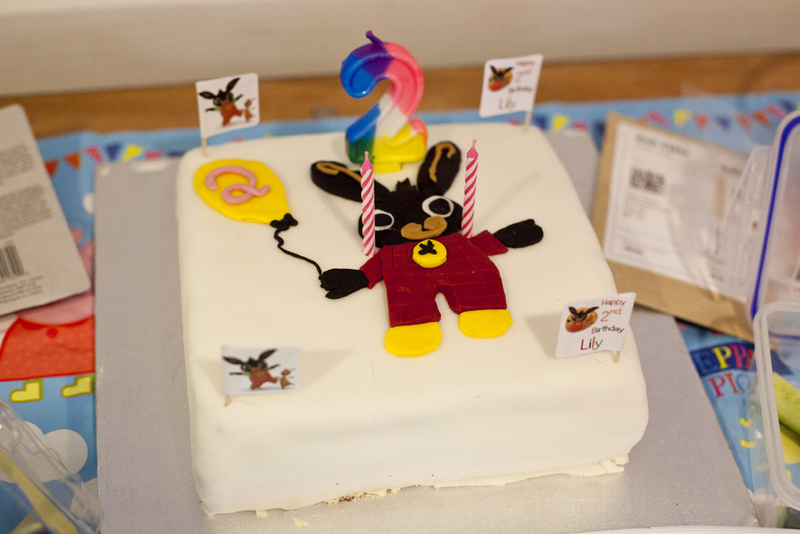 I love your bing cake and it looks like the party was lots of fun! It sounds like it was a great party! Love the Bing cake! Hope she had fun! Fantastic party! I'm stealing some of your ideas! A great blog post! Love the photos too - great to see the products and foods up close! My 2 kids are older now but I miss parties like this - I am thankful my niece still enjoys parties like this! She looks like she had a ball, beautiful dress! Love the theme! You did a great job, lovely party. 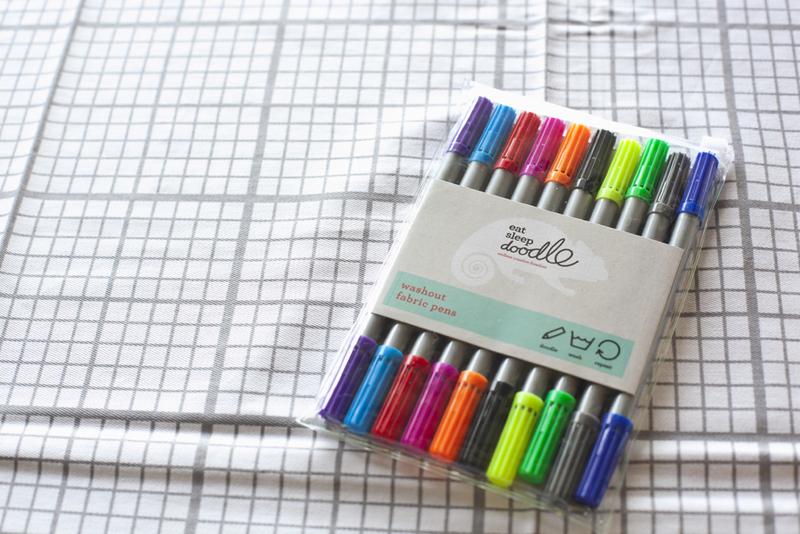 I love the doodle table cloth. Good job on the theme. I've done paw patrol before but nowhere near as thoroughly as this! looks like she had a really lovely party. The bing cake is cute! You did an amazing job and you get top marks for organisation: you seem to keep your cool! Great job, loving the cake! What an awesome cake! Well done on what looks like a fantastic party. Looks like a lovely party and fun was had by all. Good job!! I would love to have a themed party, it looks like so much fun, so I am going to have to seriously look at and budget for the cost!! the tablecloth looks fab! i have the pillowcase for my son which he loves! Looks like a super party. Brill party! My little one would've loved it. looked a brilliant party, Peppa pig is a favourite in our house too. Oh what a little love!! I bet she had a fabulous time! Happy 2nd birthday to Lily! Looks a fab party. I love a themed birthday party. The doodle table cloth though! Sounds soooo good. As so many little ones take a while before they want to eat. So this is an excellent way to keep them all at the table and eat something! What a terrific party. It's always useful to have friends who can help too - it must be good having a friend who is a DJ. looks like she had a lot of fun at her party. It looks awesome! Very nicely planned out and I love the Peppa Pig theme. My 2.5 year old is obsessed with Peppa Pig atm! 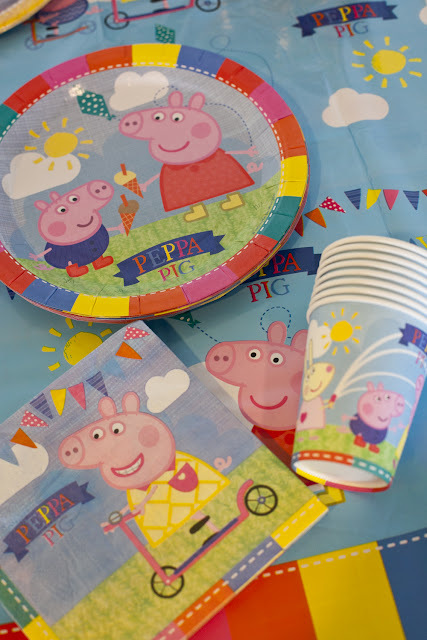 I love your adorable Peppa Pig party! Thanks for sharing it and the giveaway too. Looks great. I love your birthday message on the tablecloth idea. Nice way to remember the occasion.